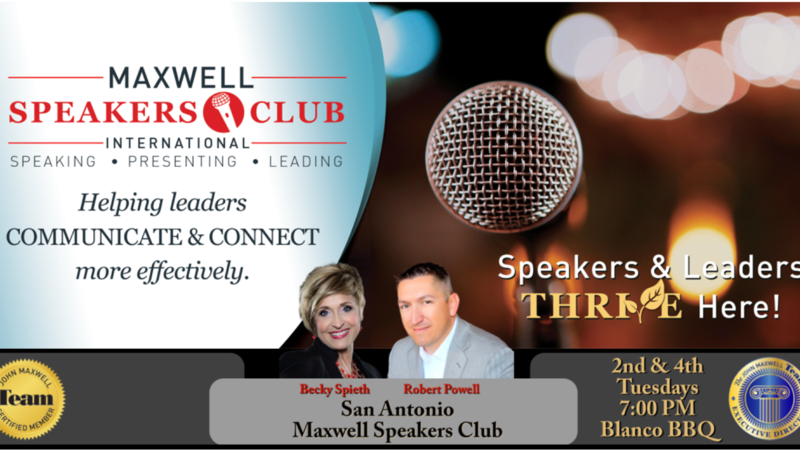 The international Maxwell Speakers Club is now available to you here in San Antonio, and will fully resource you providing world-class training in speaking and presenting. Participating in the Maxwell Speakers Club is the next best thing to being trained by John Maxwell himself. Each session we will watch and extract lessons from John's live presentations and speeches. As your facilitators we will guide you through practical exercises to help you master your communication and become a better speaker. - AND... So Much More! WHEN: We will start at 7 pm, but feel free to come a little early to grab a bite to eat, get something cold to drink, and get to know other club members. Welcome to Maxwell Speaker Club International! This up-leveled alternative to Toastmasters is now available to you. This course will fully resource you to facilitate a live, or virtual, Maxwell Speakers Club providing World-Class training in the speaking lane and an incredible way to build your own client base while adding tremendous value to others.